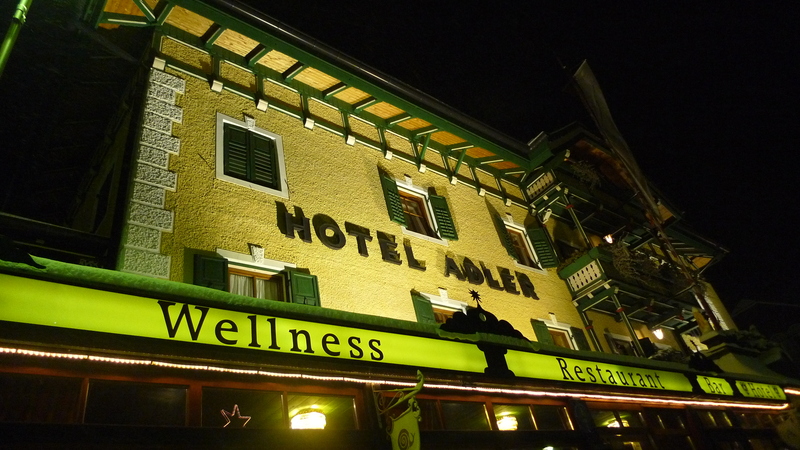 The Hotel Adler, German for eagle, has been welcoming guests for more than 400 years from its perch in the southern reaches of the Tyrol, where German is spoken and Italian is understood. This family-run hotel is owned and operated by Cristian Pircher and Helene Markart — he manages the hotel while she works her magic in the kitchen as the executive chef. Along with their outstanding hospitality staff, this husband-and-wife/chef team provides one of the best possible choices for a settimana bianca (white week) or settimana verde (green week) getaway to the breathtaking Dolomite Mountains. 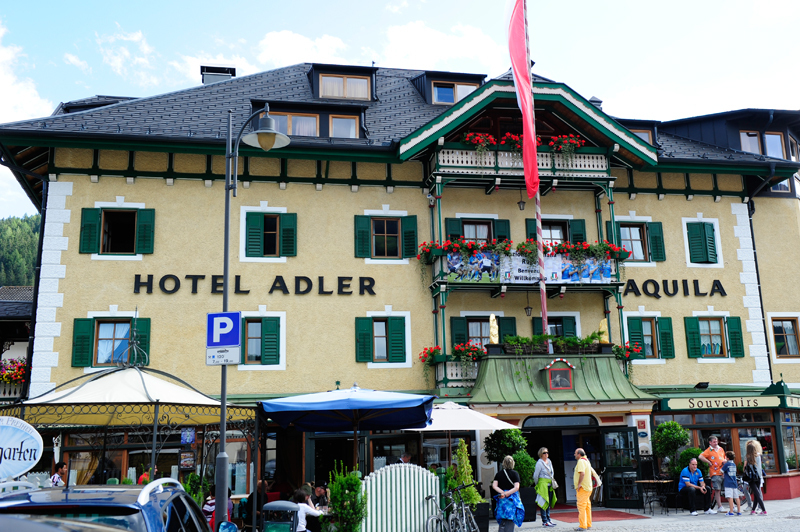 Always immaculate, the four-star rated Hotel Adler has a great alpine ambience and affords its guest with every amenity possible. 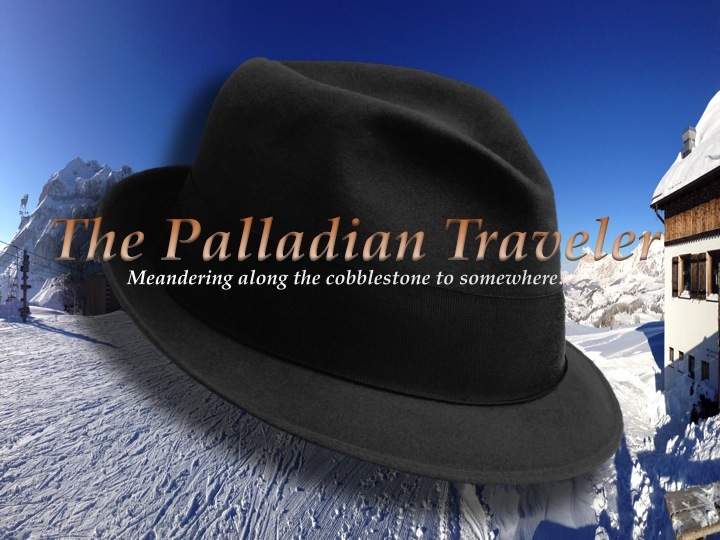 From a wide variety of room accommodations, gourmet dining — straight out of Chef Helene’s recipe book: The Magic of Dolomites Cuisine — a full-service Wellness Center, the always-popular Gathering Room and its inviting fireplace, and the hotel’s convenient location for easy access to all of the challenging Dolomiti Superski slopes. 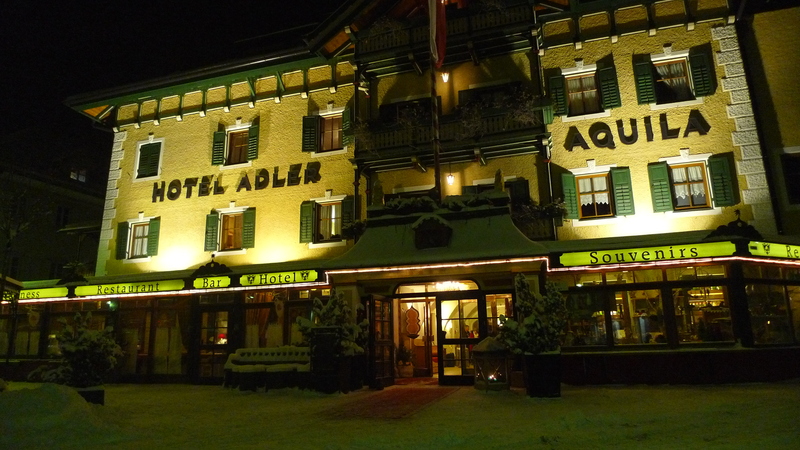 One of a select group of only 25 restaurants and inns across the vast South Tyrol, the Hotel Adler carries the prestigious Südtiroler Gasthaus designation from l’Unione Albergatori e Pubblici Esercenti (Hotel and Restaurant Keepers Association – HGV). This Good Housekeeping-like seal-of-approval guarantees the tourist-visitor that the Hotel Adler is doing its utmost to preserve and promote the historically rich South Tyrollean inn culture, maintaining its landmark building, and for its exclusive use of local, seasonal produce and agricultural products typically found in traditional South Tyrollian cuisine. With all of this at your fingertips each and every day, it’s easy to see why I tag along with the group that makes up the fun-filled Ski Trek Villabassa, a week-long, annual get-together at the Hotel Adler for the past 23 years. For complete information and to make your reservations, visit the hotel’s website, in English, at: http://www.hoteladler.com/en/index.asp. The Hotel Adler, 400+ years of expert service and counting.